Researchers have discovered a new tamarin subspecies in the Amazon forest of Brazil. 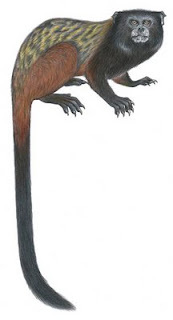 A subspecies of the saddleback tamarin, it was named Mura’s saddleback tamarin (Saguinus fuscicollis mura) after the Mura Indians, the Amerindian ethnic group that lives in the Purus and Madeira river basins where the tamarins can be found. This new subspecies has a gray and dark brown pelage and a distinctly mottled “saddle”. Its coloration is distinct than the two of its geographically closest relatives, the Wendell’s saddleback tamarin (Saguinus fuscicollis weddelli) and Avila Pires’ saddleback tamarin (Saguinus fuscicollis avilapiresi). The Mura’s saddleback tamarin weighs about 213 grams (less than 3/4 pounds) and is 240 millimeters (9 inches) tall with a 320 millimeter (12.6 inch) tail. The discovery was published in the June online edition of the International Journal of Primatology: A New Subspecies of Saguinus fuscicollis (Primates, Callitrichidae) by Fabio Röhe, José de Sousa e Silva, Ricardo Sampaio and Anthony B. Rylands.